These two verdicts are also the second and third highest verdicts obtained in New York State for all personal injury cases and the fourth and fifth verdicts obtained in New York State for all categories of law. Another auto case for which our accident lawyers obtained $5 million for a student who has struck by a van was also listed among the 2017 New York's Top Verdicts. Accidents involving motor vehicles are among the most common causes of serious injury and death in the United States each year. Despite the advancements in technology and significant safety improvements in cars and in the design of roads, automobile accidents remain quite common. In fact, car accident claims and lawsuits are probably the most common type of civil tort case filed by attorneys today. It is important to note that not every car accident will result in litigation. Where nobody is injured or the injuries are not considered serious, the No-Fault laws of New York will generally govern any bodily injury claims and restrict recovery. Conversely, the more serious the injury that results from a car accident, the more likely it is that a successful recovery can be obtained. Automobile accidents are a class of tort cases which derive, for the most part, from the basic tort principles of negligence. Negligence is generally defined as the lack of ordinary care. It is a failure to use that degree of care that a reasonably prudent person would have used under the same circumstances. It may arise from doing an act that a reasonably prudent person would not have done under the same circumstances, or, from failing to do an act that a reasonably prudent person would have done under the same circumstances. In the context of automobile accidents, negligence can arise under many situations. The most common cause of automobile accidents is driver error. The common driver errors seen in auto litigation are: failure to yield the right of way, Following too closely, driving at an excessive rate of speed, driving while intoxicated and driving under the influence and disregard of traffic control devices. These are not the only causes of auto accidents, however in our modern world, distractions to a motor vehicle driver have become an increasing cause of accidents. Common distractions include: car driver uses a cellular phone, car driver attempts to read, car driver puts on makeup, car driver changes the radio station and numerous other distractions both inside and outside of the vehicle. Another significant area of automobile litigation, often seen in a commercial vehicle setting, involves the failure to properly service and maintain the vehicle. This failure is being seen more frequently in automobile litigation every day. Typically, they will involve the breakdown of a part of the car,truck or bus due to the failure of the owner or a service company to properly maintain and service the car, truck or bus. The results of this failure are, quite often, catastrophic. For example, the simple failure to properly lubricate the bearings on a car or commercial vehicle, such a truck (a standard maintenance item) can result in an entire wheel assembly becoming disengaged from the vehicle while driving. A special class of automobile accidents involves factors external to the driver or the vehicle. These are generally known as roadway defect cases. They can involve the design of the roadway itself wherein a: poorly designed roadway, means of controlling traffic can cause or contribute to an accident, construction or debris can cause or contribute to an accident and negligent design and maintenance of the roadway. Automobile accident litigation may involve a unique class of litigation known as products liability. In the automobile context, these claims involve a defect in a given motor vehicle which caused the accident and resulting injuries. These defects can include tire blowout, brake failure and mechanical failure. Frequently, the responsibility for an automobile accident does not rest with one single party. In fact, there can be multiple factors which caused or contributed to a automobile accident. Among the most common contributing factor to a motor vehicle accident is the conduct of the injured person himself/herself- the plaintiff. In those situations, rather than deny the plaintiff in a car accident case any recovery, a jury is permitted to compare and apportion the negligence of the plaintiff against that of the defendant and adjust its damage award to the plaintiff according to the degree of comparative negligence of the plaintiff. Thus, if a jury finds the plaintiff 25% responsible for an accident, the jury can reduce the plaintiffs recovery by 25%. Under some situations, a jury can find that an injured party is 100% responsible for a motor vehicle accident. If that is the case, the injured party will not be entitled to a recovery, no matter how badly injured he/she is. It is also important to note that, in some jurisdictions (i.e. New Jersey), a plaintiff who is found to be more than 50% responsible for the accident is not entitled to recovery at all. This is not the law in New York, however. Unique, technical laws exist which govern the ability of an injured person to recover under these situations where a negligent driver has either no insurance or minimal insurance. Where the negligent driver is uninsured, it is often difficult for a person who is injured in a car accident to obtain appropriate compensation. If the injured party carries what is known as "uninsured motorist coverage" through their own automobile insurance policy, they may have a source of compensation in the event that the other driver fails to carry insurance or cannot be identified (i.e. a hit and run accident). More commonly, the offending driver is under-insured and carries inadequate insurance coverage, often at the minimum level required by state law. Many states have very low insurance requirements, which unfortunately means that some of the worst drivers on the road carry inadequate coverage due to the high cost of insurance which results from their bad driving records. Under the laws of certain states, a person may be able to protect themselves in the event that they are in an accident caused by somebody who carries inadequate coverage by purchasing additional coverage through their own insurance company. If they are injured through the fault of an underinsured motorist, they may be able to obtain recovery through their own insurance policy. There are laws that proscribe the time limits within which a person injured in a automobile accident must take certain steps to protect their legal rights or forever be prevented from proper and adequate compensation. For example, a person may be entitled to have their medical expenses resulting from a motor vehicle accident paid for by the applicable No-Fault Insurance policy. In order to obtain insurance coverage through the No-Fault system, certain information and forms must be provided to the proper No-Fault Insurance provider within a limited time-period following a motor vehicle accident (typically 30 days). The failure to provide all the required information within the specific time limits may cause the denial of an injured person's right to payment of necessary medical expenses. Furthermore, states have passed laws that mandate that a lawsuit based upon injuries sustained in an automobile accident must be brought within a certain time frame. The failure to bring a lawsuit within such a time frame is considered fatal. In other words, a failure to bring a lawsuit within the Statute of Limitations will prevent any recovery regardless of the merits of the case. The personal injury attorneys at our firm have helped thousands of families suffering serious injuries as a result of car, truck, bus or other vehicle collisions. We retain expert accountants, financial analysts and economists because every personal injury case has its own set of associated costs, including pain and suffering, lost wages, the cost of care and many other monetary costs. In order to accurately assess what these costs will be for the remainder of a victim's life, we use financial professionals to derive fair resolutions for injury victims. For more information on New York Car Accident litigation also see Opening Statement in a Car Accident Case. Record setting $71,000,000 verdict for a young woman who suffered a broken back in an Upstate New York car accident. This verdict is one of the highest ever in the US for this type of injury. $27,500,000 verdict for a pedestrian struck by a bus. The pedestrian suffered the loss of her leg. This is the largest verdict for such an injury in New York State history. $26,000,000 settlement for the family of a 35 year old woman who was a pedestrian struck and killed by a truck on 6th ave in Manhattan. This is believed to be the largest settlement in the history of New York for the wrongful death of one individual. $12,500,000 verdict on behalf of a pedestrian who suffered degloving injuries to her leg and buttocks after being struck by a bus. $10,750,000 settlement against a Japanese shipping company for negligence in maintaining their tractor trailer allowing the rear wheels to break off striking a pedestrian and causing severe burns and mild brain damage. $10,000,000 settlement in an automobile accident for a woman rendered blind as a result of being struck by a drunk driver. $10,000,000 settlement in Nassau County for a woman who suffered severe injuries to her legs as a result of the negligence of a bus driver. $7,125,000 verdict for a man who suffered serious injury when he was struck by a car at an improperly marked New York City roadway construction project. For more information on this case click here. $7,000,000 settlement for a 68 year old man who was struck by a Town of Parsipanny bus that turned into him while he was crossing the street. The Judge stated that he believes this was the highest settlement ever in any case he has handled in the last 20 years in Morris County N.J.
$6,100,000 for a woman who sustained severe head injuries as a result of being struck by a motor vehicle backing up in Manhattan. $6,000,000 settlement for the family of a Westchester County man who was killed in an automobile accident when a drunk driver struck a stopped Police car resulting in an explosion and fire. $5,500,000 settlement on behalf of a bicyclist struck by a police car which was pursuing him. $5,000,000 settlement for a woman in an automobile accident injured by a drunk driver. She also suffered partial paralysis as a result of the negligence of her treating physicians. $5,000,000 settlement in a wrongful death case in which a father was killed in an auto accident. $5,000,000 settlement in a wrongful death case in which a bar permitted a man to continue to drink alcoholic beverages before he started driving. That man then drove his car while drunk, killing a father of two children. $5,000,000 recovery in New York County for the widow of a physician struck and killed by an N.Y.P.D. tow truck while he was riding his bike on the Green Way on the West Side when the truck made a right turn on to the path and crashed into him. The decedent was not wearing a helmet. $4,800,000 verdict for the wrongful death of an 8 year old child killed as the result of the negligence of a truck driver. $4,000,000 verdict for a woman who was injured in an auto accident when a car crossed into her lane of travel. Her seven year old daughter was killed in the accident, and she suffered a fractured leg. $3,500,000 for the death of an elderly man struck by a motor vehicle in mid-down Manhattan. $3,250,000 settlement on behalf of a man injured when struck by a van in front of Bloomingdale's. The injuries included multiple leg fractures and a bladder injury. $2,750,000 verdict for a man who suffered injuries when a car crossed into his lane of traffic. The City of New York was held 80% responsible (affirmed on appeal) for failing to have erected jersey barriers to prevent crossover accidents. $2,600,000 recovery in an automobile accident case for the death of a man struck by a car while sitting in a restaurant when the car crashed through the window. $2,600,000 settlement on behalf of a pedestrian who suffered leg injuries after being struck by a New York City Transit Authority Bus. $2,300,000 settlement for a young man injured as a result of negligent placement of a LILCO power line contributing to an auto accident. The man suffered head and leg injuries. $2,250,000 settlement for man suffering significant leg injuries when struck by a car. $2,050,000 recovery in a New York car accident case for a pedestrian who suffered spinal injury and surgery. $2,050,000 verdict for a man who was struck by a transit authority bus while riding his bicycle. He suffered pelvic injuries and urethral injuries. $1,500,000 settlement in an automobile accident case for a woman who sustained serious injuries to her hand in Suffolk County when her vehicle was rear-ended by an asphalt truck whose brakes failed due to the company's failure to maintain them properly. $1,500,000 settlement for a woman injured in an auto accident who suffered jaw and elbow injuries. $1,250,000 recovery for a man in an automobile accident case who suffered leg fractures when struck by a car while riding his motorcycle. $1,250,000 settlement for a woman who suffered significant leg injuries in a car accident. $1,200,000 settlement in an automobile accident case on behalf of a Staten Island motorcyclist who sustained serious foot injuries when he was struck by a vehicle making an unsafe left-hand turn. $1,200,000 verdict for a man who suffered a herniated cervical disc when an adolescent dropped a pumpkin from an overpass onto the Long Island Expressway striking the windshield of is car. $1,200,000 verdict for a woman who, while riding her bicycle, suffered a lower back injury (herniated disc) after being struck by a car. The attorneys at Gair, Gair, Conason, Rubinowitz, Bloom, Hershenhorn, Steigman & Mackauf advocate for our clients' full financial recovery through detailed, meticulous preparation for trial. If you have been injured in an automobile, truck or bus accident, please Contact our firm to discuss your case. Our NYC car accident lawyers obtained the two highest auto accident verdicts in New York State in 2017. 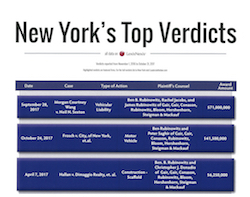 A total of 3 of our motor vehicle cases were listed in the 2017 New york's Top Verdicts. My work with the lawyers and support staff at Gair, Gair was remarkable. Everyone was extremely responsive and kind, and - most importantly - got an amazing result for me post injury. I came to the firm after a devastating car accident left me paralyzed from the chest down. Through the dedication and professional expertise of the attorneys I worked with, I received a settlement which allowed me to regain significant independence. I am forever grateful to Tony Gair and his team and highly recommend this firm to anyone looking for incredible client care and great legal results.